The Corn Cob grit is 100 % natural, bio-degradable and renewable resource. We’ve been controlling the quality and consistency of our products providing consistent, reliable Corn Cob grit for a wide variety of applications. Corn Cob Grits is an excellent Abrasive & Absorbent media suitable for use in polishing, drying, blast cleaning of engineering, metal & plastic components/parts. It polishes and debur parts and at the same time cleans and dries parts. It absorbs oils and other liquids from wet mass during finishing processes. 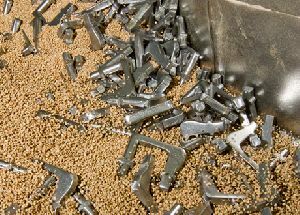 It polishes the finish product through vibratory and tumbling process . It does not stick the components while being used for removal of Moisture, Oil & Grease. Grit will not scratch on aluminum or fine brass. Non-toxic blast cleaning media—causes no health or environmental hazards. It is Dust-free, Long-lasting and re-usable which reduces cost of finishing operations. Because of its environmentally-friendly nature, the disposal of Corn Cob, once a job is complete is much easier .